Since 1998, more than 20,000 state university workers have opted into a 401(k)-style plan instead of the traditional pension plan. Illinois crafted the solution to its pension crisis nearly 20 years ago. That’s when lawmakers passed an inspired retirement plan that gave state university workers an alternative to the traditional pension plan, one that offered more flexibility, portability and individual control. The problem is many lawmakers don’t even know that plan exists. More than 20,000 university workers have opted into this alternative 401(k)-style plan since its creation. Those who have joined avoided the trap of an Illinois pension system that offers its members no control, no voice and no exit. Meanwhile, their peers in the State Universities Retirement System, or SURS, pension plan are participating in a pension fund that has only 41 cents of every dollar needed today to pay out benefits to retirees. 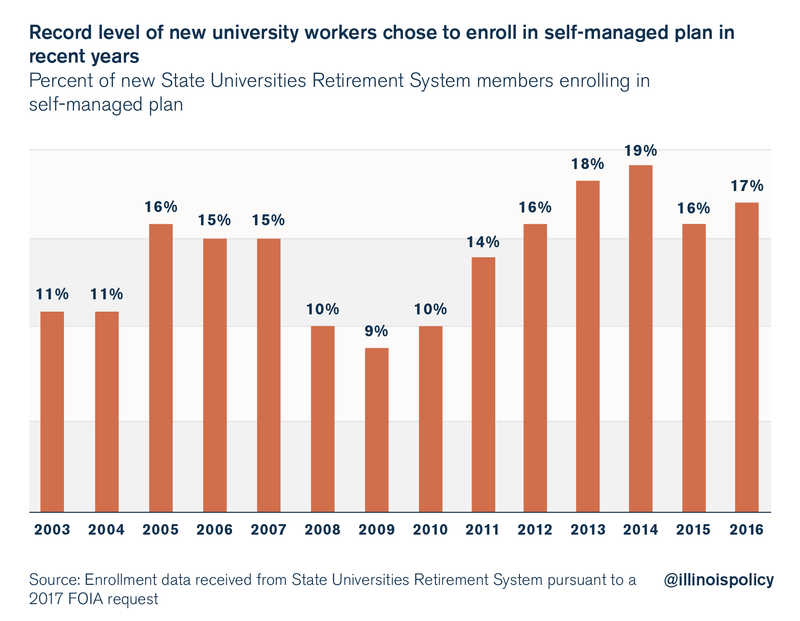 While the SURS pension system faces uncertainty, university workers’ 401(k)-style plans are portable, money is set aside in each employee’s name, and workers don’t have to worry about retirement IOUs from the Illinois General Assembly. And because university workers in 401(k)-style plans are required to make contributions to their accounts, their retirement funds grow steadily. That’s unlike private sector workers, who often don’t contribute as they should or withdraw funds early from their 401(k)s.
In contrast to the growing accounts of 401(k) members, pensioners are watching the funding level of their pension plans collapse. Today, despite record stock market returns, Illinois state pension plans are missing over 60 percent of their funds. Illinois workers in traditional pensions are owed $130 billion and counting. With pensions in such a mess, it begs the question: Why aren’t all Illinois workers – not just university workers – given the same choice regarding their retirements? An overwhelming majority – 78 percent – of Illinoisans said they favor giving current state workers the option to leave the pension system and enroll in a 401(k)-style retirement savings plan. Nearly half of all Illinoisans said they strongly favor such a plan. That’s according to a recent opinion poll of Illinois registered voters conducted by Fabrizio, Lee & Associates. Another 60 percent of poll respondents said they favor a proposal that puts new state government workers into a state-managed 401(k)-style plan. 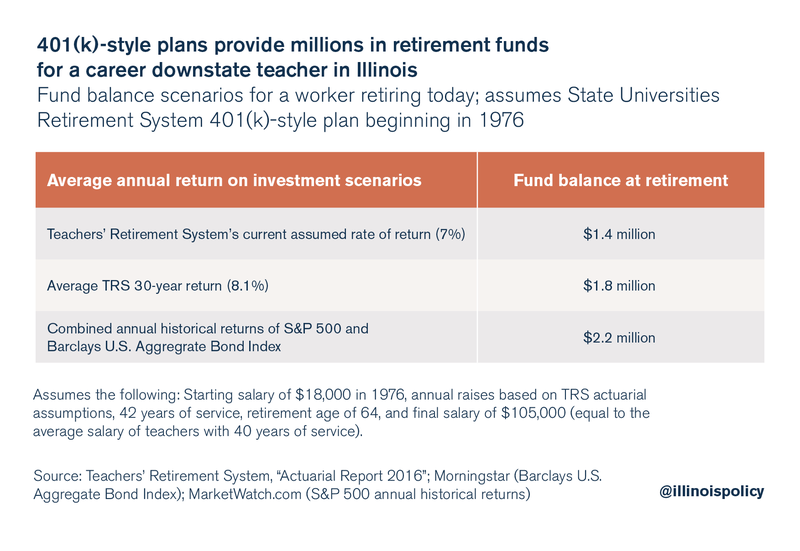 With a majority of Illinoisans supporting 401(k)s for public employees, expanding the existing SURS 401(k)-style plan to all state workers should be an easy reform for Illinois politicians to embrace. University workers like the 401(k)-style plans because a healthy 15 percent of a worker’s salary is set aside each pay period. Each worker contributes 8 percent of each paycheck into his or her own 401(k)-style account, and the state matches that contribution with another 7 percent. The 401(k)-style plan calls for a 15 percent contribution because, like the traditional pension plan, university workers in the 401(k)-style plan don’t contribute to Social Security. More than 20,000 university workers have joined the 401(k)-style plan since it was created in 1998 – and it continues to attract new members every year. Since 2012, 15 to nearly 20 percent of new university workers have chosen to enroll in the plan annually. That’s a high level of participation considering the pension plan, and not the 401(k)-style plan, is the automatic default plan offered by Illinois’ public universities and colleges. Illinois is still far behind the curve when it comes to offering retirement freedom to its state workers. Michigan froze its pension plan in 1997 and moved new state workers into a 401(k)-style plan. In late 2016, a Michigan Senate committee approved a measure to add teachers to the plan. Alaska did the same for new state workers and teachers in 2005. Momentum in favor of 401(k)s has also picked up since the Great Recession. Virginia, Tennessee, Georgia, Utah, Rhode Island and Oklahoma have all included self-managed plans as part of their new retirement systems since 2008. Oklahoma was the most recent state to enact reform. It moved most new government workers into a 401(k)-style plan in 2014. All these states have followed the lead of the private sector, where nearly 85 percent of workers are now enrolled in some form of defined-contribution plan. Opponents of 401(k)s also ignore the fact that politician-run pensions are far riskier than 401(k)-style plans. Lawmakers have left most Illinois pension funds headed toward bankruptcy while draining local government budgets. 401(k)s don’t provide enough retirement savings: University workers are required by law to invest in their 401(k)s. They can’t skip contributions or withdraw funds from their accounts like many in the private sector can. The state is also legally required to contribute funds into the worker’s account every pay period. It can’t offer IOUs like it does for pension funds. That’s why 401(k)-style plans, as structured in the SURS plan, can provide millions in retirement funds for the average government worker. For example, if a newly hired teacher had been allowed her own retirement account in 1976, she could retire today with between $1.4 million and $2.2 million in retirement funds, depending on her investment returns. Click here for more details regarding the investment scenarios. Members can receive help in managing their investments. SURS and the investment fund managers are there to provide individual investment advice to workers throughout their careers and into retirement. 401(k)s don’t provide a Social Security-style benefit: SURS offers many options for workers to create Social Security-like benefits. The SURS 401(k)-style plan members can buy bonds, diversify their portfolios, and purchase target date funds that balance an individual’s investments among assets with varying degrees of risk. “[At retirement] you may elect to take a lifetime annuity payout which you cannot outlive. 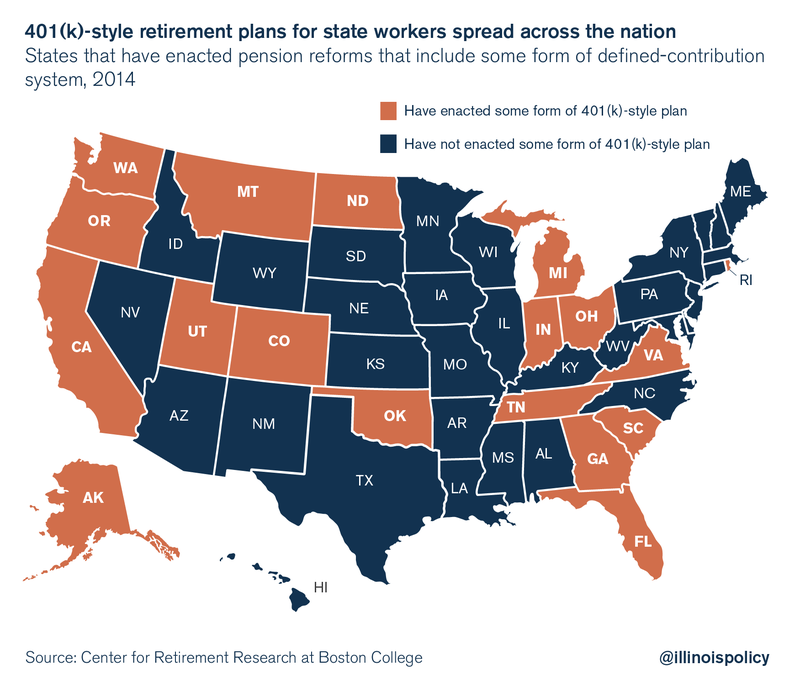 Illinois politicians can begin an end to Illinois’ pension crisis by extending the SURS 401(k)-style plan to all state and local workers. All new state workers would be enrolled in a new 401(k)-style plan going forward. And all current workers would also be given the option to enroll in the 401(k)-style plan. If they opt in, their already-earned pension benefits would be protected. The pension benefits of current workers who do not enroll in the 401(k)-style plan, as well as current retirees, would not be affected by the 401(k)-style plan. This would be the first step toward transforming state worker retirements for the better – giving all state workers the flexibility, portability and individual control over their retirements that they deserve. Such a plan complies with the Illinois Constitution, is fair to taxpayers, and gives new workers retirement freedom. Lawmakers embraced 401(k)-style plans 20 years ago for just one class of state workers. The only fair thing to do now is to offer that same 401(k)-style plan to all employees.